' Preschool Valentine Gift - Sisters, What! Let's talk Valentines Day. I love it. I love a day that is about those we love and care about. It's another great holiday. 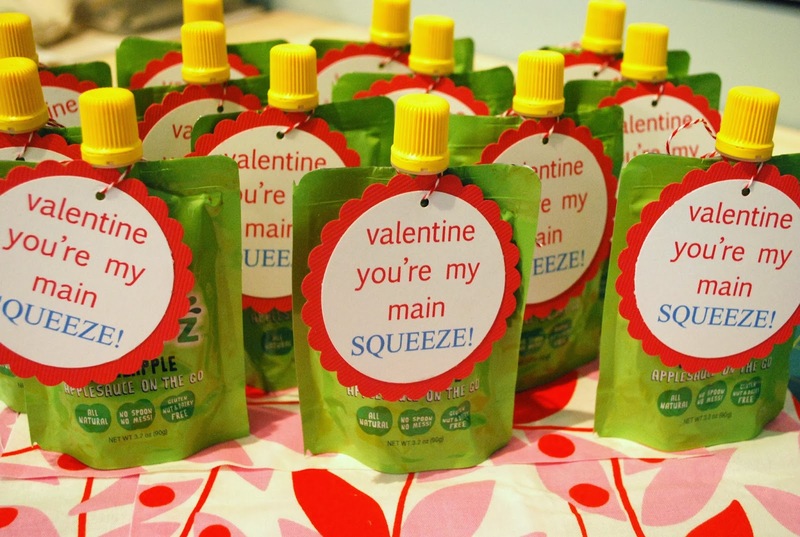 This year I was a bit sad that my oldest is now "too old" to take valentines for all her class mates but happy that my little Jackson was now in preschool so I could make some really cute valentines for all his little friends. Once thing I don't like about valentines is all the sugar that comes with it. So when I found this cute idea on Pinterest via Funky Polkadot Giraffe I knew I had to make these. Kids love these and they are healthy. 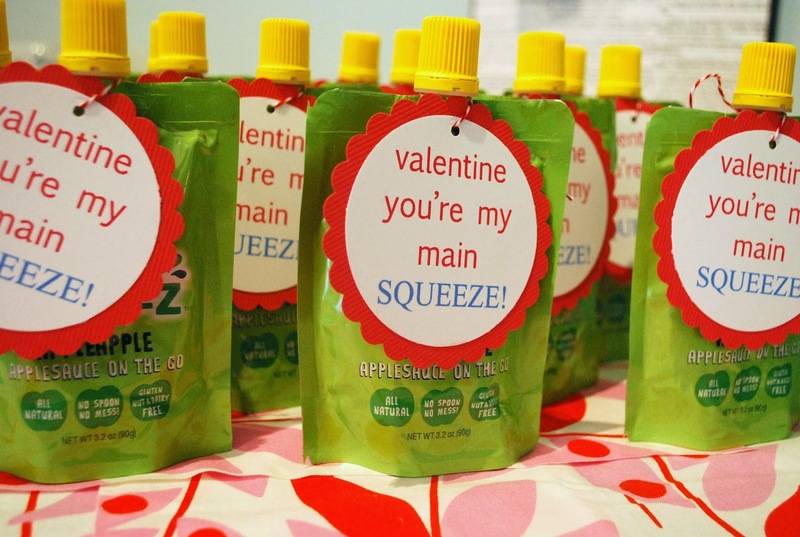 What parent and kid won't be happy to see these in their child's valentine loot? For some reason I couldn't open her document on my computer so I just went ahead and made my own in Word. These are the items I used. I loved this one because I didn't have to buy anything, even the Go Go Squeeze were already in my pantry. I really love making something from stuff I already have. Anyway it was pretty easy. I made the word document. Printed it out on card stock. Then I used my round punch to punch them out. I then punched out the same amount of scalloped circles with some pink card stock. I attached the top circles to the scalloped circles then punched a hole at the top with my tiny hole punch. 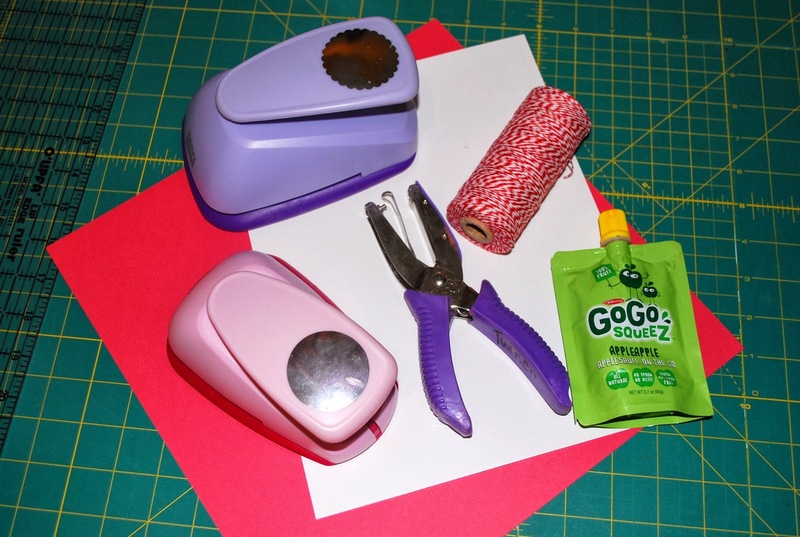 I used the baker's twine to attach them to the Go Go Squeeze. There you go...easy! If anyone is interested in the word document I could email it to you. Just leave a comment in the comment section with your email address and I will send it off. Enjoy! Very cute! If you have time, could you please email it to me at sherastinson@gmail.com? Thank you!